Comming Soon to the iTunes Store! Every photo has a story or two to tell. 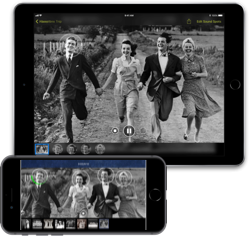 AlbumWALK makes it easy to capture the memories of those who were there when the photograph was taken. Using AlbumWALK's patent pending tap-talk interface, just tap a face on a photo on your iPad or iPhone, and talk about that person. Tap the next and talk. And when you have finished, AlbumWALK creates a mini-documentary, zooming in on each person as they are mentioned, along with professionally scored background music. So the next time you look through old photos with a relative, say "Let's go on an AlbumWALK" and create talking photos that will retell their stories for generations to come. System Requirements: Requires iOS 10.3.1 or later. Works on any iOS 10-compatible iPhone or iPad: iPhone 5 or later, iPad 4th generation or later, iPad Mini 2 or later, and iPad Pro or iPad Air. Capture photos on your iPad or iPhone, take them from the Photos app, or scan them in ahead of time. Use the patent-pending tap-talk interface to capture Soundspot™ recordings one after another without interruption. Play back recorded memories one at a time, or all together in a mini-documentary with a soundtrack. Edit Soundspot recordings to change the size and placement, trim the recording, or record over again. Playback on any iPad or iPhone, or transfer using TreeVault™ to play inside Family Tree Maker. Sign up for AlbumWALK news! If you'd like us to let you know about the latest product news and updates, please fill out the form below. AlbumWALK - Newsletter Keep me up to date with news about AlbumWALK. AlbumWALK - School/Group Licenses I'd like to know how to get a huge discount on AlbumWALK for my school or genealogy group. Family Tree Maker - Newsletter I'm interested in technology for genealogists. © 2019 The Software MacKiev Company. FamilyTree Maker is a registered trademark, and AlbumWALK, TreeVault, Soundspot, and Software MacKiev are trademarks of The Software MacKiev Company.